The town of Narooma is named after the Aboriginal word for “clear blue waters” so it’s really rather appropriate that the course stretches out on cliff tops overlooking the Pacific Ocean with views of Montague Island to the east and Glass House Rocks to the south. Narooma Golf Club is famed for having some of the best kept greens in New South Wales and the course throws up one or two surprises with several blind tee shots to be negotiated and forced carries across water at holes 8, 10 and 15. Holes 1 to 6 sit on cliff tops above the Pacific Ocean. The course then heads inland for ten holes (with fairways flanked on either side by trees) before the routing returns to the coast for the closing two holes. The original nine holes were laid out in 1930 but Head Greenkeeper Harold Burke rerouted the course in 1952 when the club acquired additional land. Burke made the most of the new terrain and most of these links style holes have views of the Ocean. Course Superintendent John Spencer added a new nine in 1980 and the holes are laid through woodland a little distance from the coast with several of the fairways routed around a dam. The signature hole on the property (“Hogan’s Hole”) is the spectacular par three 3rd, requiring an ocean carry all the way from tee to green. The hole came to national prominence when the actor and comedian Paul Hogan used the site for the filming of a Winfield cigarette advertising campaign in the 1970s. Until 1967 the golf course was a short layout (rerouted by Harold Burke in 1952) with sand greens and no water. With the help of NZ Golf Course Architect Sloan Morpeth, a new and lengthened layout was drawn up with new teeing grounds and putting green positions. 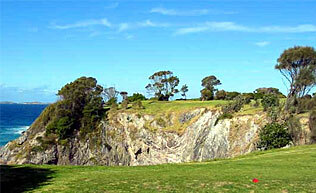 The 'Hogan Hole' had a tee constructed on the cliff top to force golfers to play to a green situated above the cave. Ray Bradley, formerly of The Australian Golf Club, constructed the new 9-hole greens and fairways (including the 'Hogan Hole') to the Architect's specifications. In 1973 Course Superintendent John Spencer came to the club and completed the second 9 holes creating this wonderful 18-hole golf course. Narooma is one my favourite courses in Australia! It is where my golfing life started outside of Canberra, down the coast on family holidays. The opening 6 holes start along the cliffs with the ocean collecting any stray shots on links style golfing holes, or by the abalone divers! The signature hole greets the golfer early in the round on the 3rd hole and what a hole she is! A 141m Par 3 over a cliff to a green surrounded by bunkering both sides. The back 9 holes from 10 - 16 are through the natural rolling Australian bushland with the 15th hole the highlight! Breathtaking front 6 holes plus the 18th, tight back nine section make for a truly unique golfing experience. Be careful of the wind on the coastal holes as well. A course of great variety. The first 6 holes are played along or to and from the cliff and the rest of the course heads inland through the forest. A tough walking course – not overly long at about 5900m but at times very hilly and some long walks from green to tee. If you are in holiday mode and you bring the kids out just let them know not to go near the sheer cliff drops that are 3 metres off the fairway at holes 2 and 3 and tee box of 4. The opening holes are quite expansive and you can have a bit of a lash with the exception of # 2 where a draw or hook is wet. The greens are sizeable with a number of them tiered and it’s a good thing to be below the hole as they are slippery. Holes 8-16 played across the road contain the best holes. The signature hole is #3 (very similar to #6 at Eyemouth) however the inland holes are well shaped and need much tighter driving as they are either tree lined or well bunkered with the lagoon playing a large role in a number of holes. For me holes 15 and 16 are the best holes on the course. The par 3s (aside from hole 3) are a bit weak. 9 is a straight 170m, 14 is a slightly downhill 150m and 17 is a steep uphill 125m. None of them bring much to the table. The par 5s are lovely looking holes but they are all a bit short, none of them stretching to over 450m and a decent drive will give you the chance to get home. The four par 5s however are all nice holes but just need another club or two of length. The last hole is not long but is so steeply dog legged and protected it is almost impossible to have a go at the green. If you get a 200m drive (needs to be left) away you can either cut the corner and go for the green in a completely blind shot as you are going over some serious trees or you can lay up with anything as low as a wedge to have a straight forward shot into the green.